Two years ago, I started dealing with the half of our core homestead that's severely waterlogged. 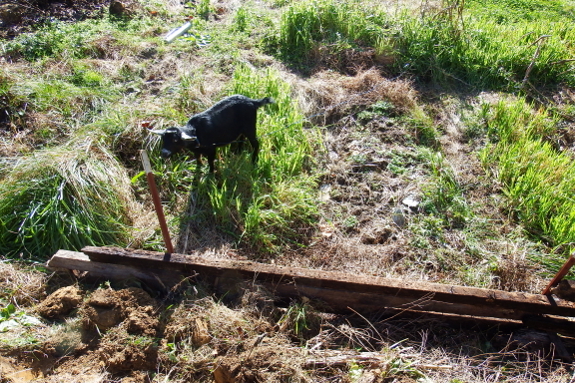 My solution was simple --- build high raised beds that pull the root zone out of the swamp. In two areas, this technique worked like a charm, but the lowest point (our gully) was simply too damp. 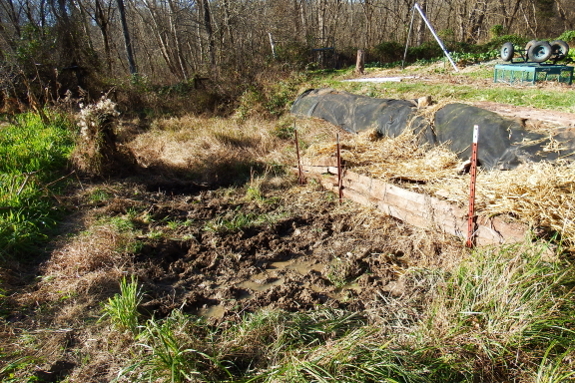 As you can see in the photo above, the water table stays about five inches below the top of the beds in this area, and crawdads moved in to build tunnels yet closer to the surface. After two years of watching summer crops perish due to wet feet, I decided to move on to plan B. We don't have enough sunny spots that we can waste any, so I decided to move all of the good soil out of the gully beds and into one large terrace along the south-facing bank of the gully. In the past, we've had good luck using fence posts and rotting wood from an old house we tore down to make terraces elsewhere, so I replicated the methodology in this spot. The wood will eventually rot away, but by then tree roots will be holding the soil in place. 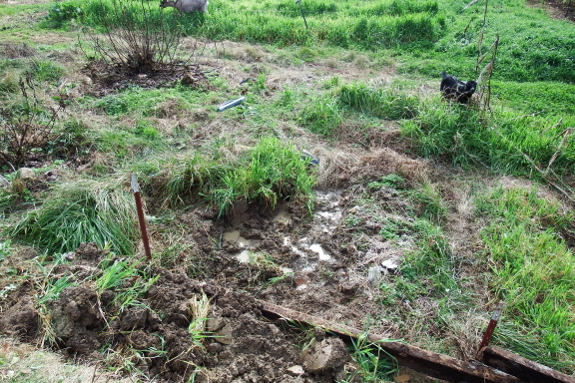 There was just enough soil in the gully beds above water level to fill the terrace. Actually, there's still quite a bit of rich dirt left behind, but I'll have to wait until the dry season to excavate it. Wet dirt is heavy! Then, once that's done, I'll either plant the denuded gully area in cattails to create a wetland or try to dig it deep enough to make a little pond. In the meantime, my focus remained trained on the new terrace. 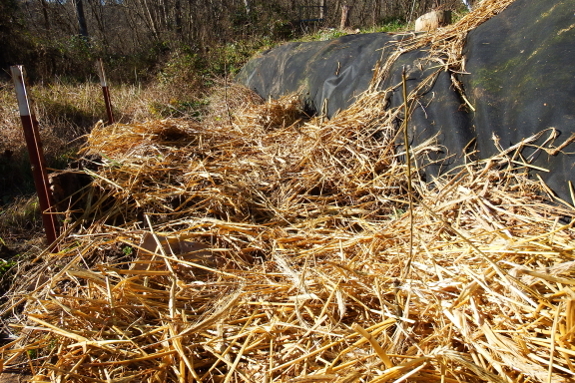 I had a good length of woven, 10-year plastic leftover from summer experiments, so I laid it along the side of the gully behind the new terrace to keep this area weed-free. I suspect if I want the plastic to really repel weeds for a decade, though, I'll need to block the sun somehow. Perhaps creeping phlox (the local choice for this application) or thyme planted in holes in the weed barrier will suffice? For now, though, the terrace is good enough as-is. So I set out three dwarf pear trees that I grafted this past spring, watered them in with black-soldier-fly leachate, then kill mulched the babies with cardboard and straw. Here's hoping the saplings get their feet under them quickly and grow! If the 23 states suing the EPA over their Waters of the US (WOTUS) regs and the injunction is lifted, what you have done will have become illegal and you'll be subject to big fines. Big Brother is watching. On a lighter note, I'm not familiar with the exact topography of your land: is there a nearby lower spot than this plot you're talking about, or is it a dead end kettle? Drain tiling would involve a little less digging and works remarkably well to lower the water table of a field. If not, then what you're doing may be back breaking work, but clever and effective. doc- while I'm not very familiar with the layout of the farm and certainly not an expert on environmental regulations, I think there are certain criteria Anna's terraforming would have to meet before the WOTUS rule affects her modifications. The EPA's website says gullies and shallow subsurface water are specifically excluded from the WOTUS rule, so it seems like whether the rule makes the gully subject to the Clean Water Act would have to depend on whether it also qualifies as a wetland (before or after Anna's mods). If it does, the WOTUS rule says the wetland would have to be within 100' of a navigable waterway (probably the creek). Or, if the gully is within the 100 year flood plain, the cutoff distance from the navigable waterway jumps to 1500'. 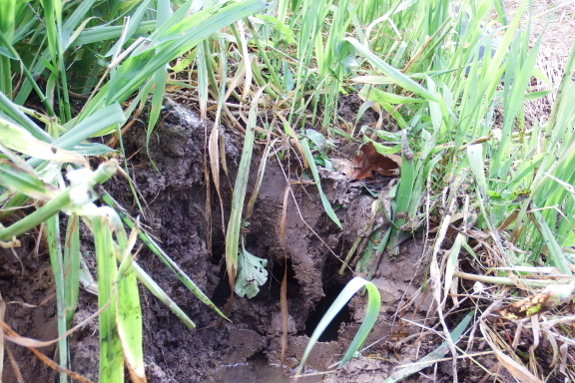 Whether it meets the definition of a wetland when there's not surface water or year-round shallow subsurface water seems to hinge on what kind of plants grow there. Planting cattails would probably make it qualify. At least, that's what I get from browsing the WOTUS rule text and the EPA's wetlands page. Hopefully Anna can get some clarification before getting too far!